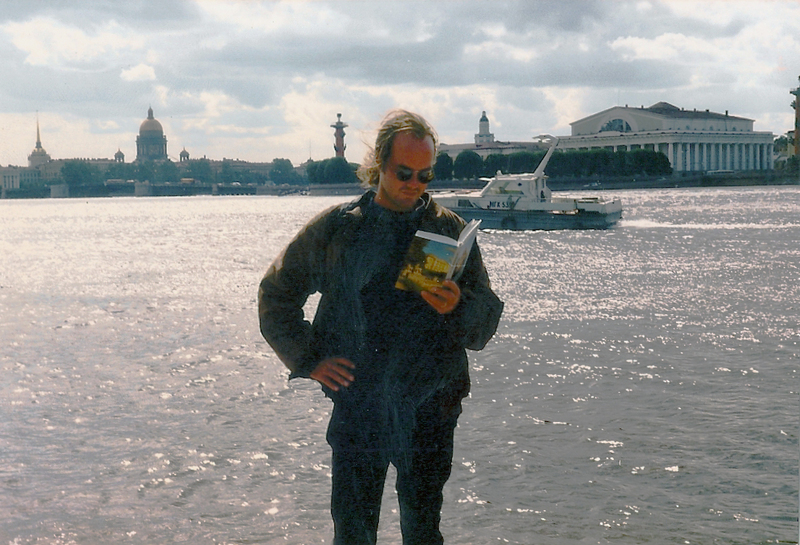 John M. Edwards, “The Manhattan Candidate,” reads an outdated Guide to Leningrad in modern-day St. Petersburg, Russia. . . . INTERESTED in finding the St. Petersburg salon where the protagonist of Doestoevsky’s Notes from the Underground is snubbed and ridiculed by his friends, I set off for that fair city sometime in the springtime, I believe. In Helsinki, the Russian Embassy was swamped, and an American consulate staffer with long brown hair and a baseball cap gave me a quick pep talk. At the time it was still a little iffy whether Americans were allowed to go to St. Petersburg outside of a bus tour, so the only other recourse was to get a disposable visa and wire-reserve a reservation at an official YHA hostel to travel independently there. Once inside, the visa was quickly procured, stamped on a loose piece of paper, of course, which was to be casually lost after the trip was over, so as not to raise suspicions at the State Department. Later at the train station, I once again spotted in a green suit and with a briefcase stickered with “I WANT YOU” Yuri. At the YHA, a Russian with an American accent, who said at least he was really American and from New York, shook my hand and handed me a key. I stumbled down the hallway, noticing with approval posters of both Mikael Gorbachev and Boris Yeltsin. Whump, on the bed and soon asleep, I swatted the bedbugs that were to plague me every night. A while before the trip (I had already been to communist central and eastern Europa in 1989), I purchased a subscription to SOVIET WORLD, whose editorial focus remained industrial productivity rather than architectural legacy. Alongside photos of hydroelectrical dams and metal smelters glowing red under the symbolic Hammer and Sickle—“Peasants Progress”–there was the occasional article on Yuri Gregarin, the first cosmonaut in space. Over my morning cup of Sanka, breakfast of astronauts, always served hot to neutralize the microscopic bugs in the water supply, we all sat around the table feeling vaguely stunned. “Yeah! What was the tip-off?! Two more Americans came in, whom I could tell were just pretending to be Americans, literally a black and white Russian, one obviously from communist Angola, the other obviously an imaginary Belarussian. What’s more, both of them said they were here to learn Russian and were wearing fashionable fur hats, even though it wasn’t that cold outside. Walking along scenic Nevsky Prospect, then under savage reconstruction with a long bone of exposed piping heading into infinity, I decided on a lark that maybe I would stay here for a year or two. An expert on Peter the Great (1672-1725), whom I might be related to from my grandmother’s “Havighurst” side of our family tree, I even felt a little like him, sans the fancy ‘stash. I also had studied him at university. “Sankt Peter,” who had become an architect in London, literally ordered the city plum out of nowhere, built over a useless swamp by the newly freed serfs, overlorded by streltsy and boyars, and the occasional Volga Boatman. Peter was so agoraphobic that he preferred sleeping in a pup tent out in the vast field, above earth and over sky, with his extensive army, rather than wither away in the rather large and lonely Winter Palace. At a fancysmancy London-style booksellers, I searched around for coffeetable books about communism. I found a neat GUIDE TO LENINGRAD, even though the name had already been changed back to “Sankt Peterburg.” In it, the writer/researcher stated that during WWII, an unexploded bomb was defused and a crumpled note was retrieved which said, “The German Workers Party Is With You!” An interesting fantasy, I suppose, but as apocryphal as borscht pie. Near the Orthodox-style Peter and Paul Fortress (where’s Mary? ), upon the river Neva, I met an old babuschka who said in Russian that she had lived in “Siberia,” thus accounting for all the fancy tattoos on her arms. Finally, I stood before what I was there to see in the first place, the lime-green-colored “The Hermitage,” the second best museum in the world, after the Louvre, of course. But I have neither the time nor the inclination to remember on paper the magnificent treasures hidden inside. Who wouldn’t take a deal like that? “No thanks, I need it, it is filled with stuff,” I settled upon meekly. Passing sunbathers along the blocky stone banks of the Neva, sunning happily in swimming costumes and sharing shots of wodka, I met a well-dressed jazz musician, whom also looked like he was from California, or maybe even Sweden, where the Scandinavian Rus originally came from. Another paradox: Russia really seemed like a Slavic mirror-image United States, the friendly people did at least, or the ones who spoke Englis. I felt like a Dostoeevskian dealmaker. Somewhere near the Winter Palace in some kind of tectonic adjunct, I entered the courtyard and decided on a door, which I assumed led into the parlor where the famous mis-en-scene I was searching for from Notes from the Underground was staged. “I’m sure this is it!” I said with sheer wonderment, tilting my head on its axis around all the comfortably bourgeoise furniture, and a neat silver samovar. My visa about to expire, I hopped the train belching a relativistic maelstrom of smoke, heading back in time to Lutheran Helsinki, and sat across from a Norwegian who resembled Christopher Walken—(could it be?). Plus, there just hanging around was an obvious Russian gangster in a blue tracksuit, who in the sunlight-sliced shadows nodded his head approvingly. . . . I thought idly that maybe in several years I would return to this fabulous fable of a “Nutcracker Suite” city–then I woke up right there again, wearing red shoes, with my outdated Guide to Leningrad on my lap. . . .
John M. Edwards is an award-winning poet and “stringer” who has traveled worldwidely.